It’s been twenty-four hours since Special Counsel Robert Mueller announced that he was giving Michael Flynn a free pass, because Flynn had been so useful in the Trump Russia investigation. Donald Trump still hasn’t publicly attacked Flynn. For that matter it’s been a year since Flynn cut a cooperating plea deal which made clear that he would sell Trump out – and yet Trump never has attacked him. The question is why. It can’t simply be that Michael Flynn has criminal dirt on Donald Trump. Back when Michael Cohen first started turning against Trump, we saw Trump publicly and viciously lash out at Cohen – and even threaten him. This was despite Cohen knowing where so many of Trump’s proverbial bodies are buried. So it’s not as if Trump’s usual strategy is now to cower to those who have dirt on him. There’s something else at play when it comes to why he’s cowering to Flynn. Rewind the clock a year and a half, and Donald Trump was going out of his way to protect Michael Flynn, even going so far as to specifically ask the Director of the FBI to give Flynn a break. Why Flynn, and no one else? Trump knowingly committed a felony just to keep Flynn from being prosecuted. Go back even further than that, and even after President Obama told Trump that Flynn was too dirty for a White House job, Trump made Flynn his White House National Security Adviser anyway. On its own, that one could be explained by Trump’s spitefulness toward Obama. 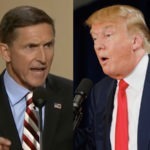 But when you put it within the larger pattern of Trump’s behavior toward Flynn, it makes clear that – from the very start of Trump’s foray into politics, to the present day in which Flynn has sold Trump out to prosecutors – Trump uniquely views Flynn as some kind of untouchable made man. To figure out why, you have to start by looking at how Michael Flynn found his way to Donald Trump to begin with. After Flynn’s behavior went off the deep end around 2014, President Obama fired him. Next time we saw Flynn, he was having dinner with Vladimir Putin in Moscow at the end of 2015. A couple months later, Trump hired Flynn as a key campaign adviser, and rest is history. It’s not difficult to parse that Donald Trump fears Michael Flynn for reasons relating to Vladimir Putin. That said, Flynn has already told everything to Robert Mueller, or else he wouldn’t have gotten a free pass. So Flynn doesn’t play for Team Putin anymore. Yet Trump is still too afraid of Flynn to even so much as post a nasty tweet about him. Mueller knows why. We’ll all find out soon enough.